So… we’re running out of time. The last couple of sessions were focussed on ensuring the piece was roughly ‘blocked’, and, given the number of chairs involved, that if we bumped into the furniture, it was meant to happen. One member of the devising cast elected not to perform, but coordinate the technical aspects of the showing, which as a result was plotted and ‘teched’ insanely quickly. 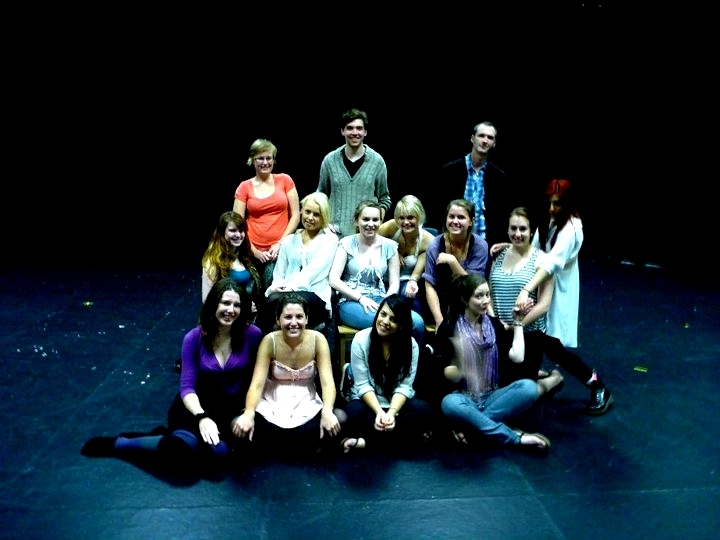 The devising cast made comments that indicated they felt relatively confident in their work. They felt it was ‘authentic’ … and kind of ‘cockle-warming’. They’d decided to keep it pretty understated, and had developed a modest, honest performance style that focussed on the performer’s connection with the material, rather than any kind of acting fireworks. Transitions between scenes, which hitherto had not been considered at all, were quickly thrown together, and it was in this rushed phase that the only male character came to the fore, shifting chairs, and preparing the space for the female stories. Here the comic and symbolic potential for his role emerged, but was not roundly fulfilled. The emerging play had not yet considered with any depth the nature of its almost entirely feminine voice. So , the work known as ‘Please Be Seated’ was performed in its rough, workshoppy state. In some ways it was closer to a moved reading than a fully realised performance. It was performed by the people who devised it, the audience was their peers, who’d just completed making their own shows, so there was a ‘lot of love in the room’, as it were. The show had been framed as a verbatim piece for its audience, so there was also a certain frisson (I speculate) emanating from the idea that the show may have been a window into the love-lives of its performers. However, as far as I knew, nobody in the cast was performing their own verbatim material, so there was a certain level of role protection going on. selected ‘chunks’ of verbatim text: these story-telling based monologues were selected by the students, and grouped into sections on the basis of a fairly free association, rather than servicing a standard narrative arc. Selected fragments of verbatim text which were redacted – literally ‘cut and pasted’ to create new sequences. Notable amongst these was a duologue where gobbets of text from the beginning of a relationship was jammed up against verbatim material from the end of a relationship. More physical ‘chair’ sequences, which mostly framed the verbatim sequences, but sometimes were utilised as comic/physical set-pieces to bring the verbatim material to life. 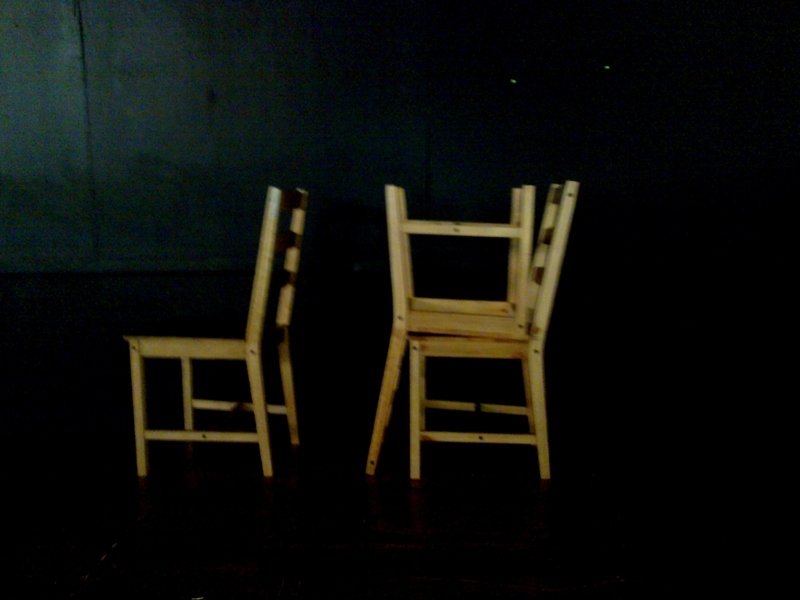 Notable here was a sequence where three chairs went to a nightclub. C] because the monologue was quirky, gentle, sensitive and sincere, it kind of let the males in the story (who’d appeared in many of the verbatim texts as negative influences) ‘off the hook’. I raised these concerns, but the group liked this monologue as a conclusion , and we’d run out of time, so it was ‘in’. As facilitator I put my director hat on and drew in the ‘chair’ concept to the closing moment, and left it at that. Along with a few rough edges, there was a lot of stillness and strength in the performance, especially considering the cast had only run through it a couple of times. The ‘chair’ sequences, which framed the verbatim sections (especially a flirty pas de deux performed to Temper Trap’s Love Lost ) proved their worth as ensemble-based tension-breakers, they varied the rhythm of the performance, as well as releasing the music from the gentle underscoring it had come to do. “A delightful performance with some great storytelling. The personified chair concept, which had room to be developed further, added layers of meaning to the performance: the cast grew in size considerably! The caretaker character acting as the gatekeeper/narrator/muse was very effective. …The group showed a developed and intelligent sense of ensemble in the piece and also demonstrated a process that was rigorous and inclusive. There was laughter, and a sense that the audience identified with, and connected strongly with the verbatim material. The general feeling was that the warm authenticity of the work could be furthered via a more active response to some of the source material, and some structural development. After the applause, the makers of Please Be Seated gathered on the stage for a happy snap. It took about 36 contact hours to make and 27 minutes to perform. This phase of the process was over, and the next about to begin.